humour | When Am I Supposed to Start Feeling Like a Grown-Up? It’s rubbish being the youngest in the family, and I should know. When I was born, my closest brother in age was already 7, and the oldest was 14. Even Prudence our cocker spaniel was older than me. This huge age gap meant that my brothers were able not merely to tease me, but to weave elaborate scams that I had no hope at all of seeing through. It was a completely one-sided arrangement because I was far too inexperienced ever to get my own back. And we had a black and white TV in the dining room with four separate channel buttons… “In case they ever bring out a fourth channel,” my dad explained to me. If my brothers and I wanted to see something different at the same time, then of course we argued about who got to use the colour set. On one particular occasion I wanted to watch The Sound of Music. My brother Nick, maybe 13 at the time to my 6, explained to me that I would be better off watching this particular film on the black and white TV. “Because of the nuns,” he replied, completely dead pan. And I bought it. I trotted meekly off to watch in the dining room. Although I assume that there must have been a tiny suspicion in the back of my mind that I was being had, because why else would I remember the incident 35 years or so later? A more regular, and possibly even more surreal piece of teasing, happened every Saturday when we would all drive from Sunderland to Newcastle to visit my grandma. My parents would sit in the front, and the four of us would be crammed into the back (no seatbelts obviously) with the dog across our knees. Then they’d fall about laughing. And my parents would tell them off, but you could hear that they were trying not to laugh, too. Now that I’m nearly 42 my brothers are really quite nice to me. And over the years I’ve become much better at making sure I don’t miss car washes. But still, when our youngest child (who is only 4) gets furiously angry because his older siblings are laughing at something unintentionally funny that he’s said, I empathise. I really do. Though it can sometimes be a struggle not to laugh, too. Do you have any equally traumatic stories of sibling teasing? If so, please tell me about them in the comments section. This entry was posted in Brothers, childhood, Family, Fathers, humour, Siblings and tagged Black and White TV, Brothers, car wash, childhood, Colour TV, embarrassment, family, humour, Nuns, Rolls Royce, Siblings, Sound of Music, teasing on March 28, 2016 by feellikeagrownup. As anyone familiar with Ray from the Mary Whitehouse Experience will know, the propensity to be sarcastic can get you into all sorts of trouble. Ray is the man cursed with a sarcastic tone of voice. You can watch him here. When I was at university – it was in the early days of email – an Australian friend sent me a message to say that he’d heard that a rare type of walrus had been sighted off the coast of the UK and had I seen any? He was, he explained, a walrus enthusiast. I replied that while I hadn’t seen any walruses, if I happened to spot one while walking through Cambridge I’d be sure to let him know. “Thanks – that would be great,” he replied. He then signed me up to a walrus aficionados’ e-newsletter. I quite enjoyed reading it, actually. It was a little window into a world I would ordinarily never have known existed. Of course, it’s well known that it’s really difficult to convey tone of voice in an email, and you therefore have to be extra careful what you say. I’m not good at taking heed of this. The problem is, I also run into trouble when talking to people face to face – particularly strangers. My husband Anthony suffers from the same problem. A few years ago we were in the Lake District with our four-month-old baby. (This was the same trip on which we acquired All Terrain Pushchair Walks, South Lakeland – click here to read more about that.) Out on a walk, our son began screaming hysterically in his pushchair. “That’s because he’s starved of affection,” Anthony replied. “Oh dear!” said the lady, clearly alarmed, and scuttled off looking as if she were about to call social services. Having failed to learn from this encounter, I make sarcastic comments to strangers all the time. I imagine I’m being funny. Given that sarcasm tends to consist of saying the exact opposite of what you really think, if the person you’re talking to doesn’t realise that you’re being sarcastic, it is excruciating. The chances are you’ll come out of the encounter looking stupid or crazy, or quite possibly both. And yet… it’s difficult to give it up because sometimes – just sometimes – the stranger I’m talking to gets the joke and laughs. And so my comment allows us to make an immediate, genuine connection that no amount of small talk can create. It is almost never worth trying to dig your way out of these situations by explaining yourself. That just leads to embarrassment all round. I tend to just swallow the misunderstanding, grit my teeth, and accept that this person now thinks I’m socially or intellectually deficient. 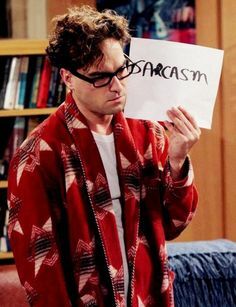 Perhaps the answer is to carry a sarcasm sign around with me, like Leonard does for Sheldon’s benefit in the Big Bang Theory. If I hold it up whenever I’m being sarcastic, I’m sure that will solve all my problems. Have you ever found yourself in trouble due to being sarcastic? Or do you hate it when other people are? Do let me know in the comments. This entry was posted in humour, sarcasm and tagged big bang theory, Cambridge, david baddiel, email, embarrassment, humour, Lake District, mary whitehouse, mary whitehouse experience, ray, sarcasm, walrus on August 3, 2015 by feellikeagrownup.